Today I needed to spruce up the barn a little. 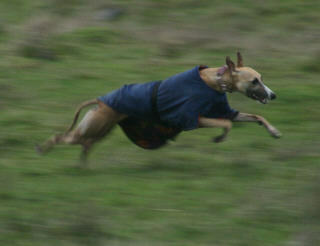 I had Paisley, my whippet, out there with me. Our barn is an old chicken barn and is 320′ long. She loves to run the length of the barn. I was spreading straw and all of a sudden the sheep came charging into the barn. I ran out to see what the problem was and I was greeted by Paisley. She must have jumped out of one of the windows. She proceeded to ignore me and race around the pasture. She LOVES to run! So, Magoo decided to lay down the law and chase her out of HIS pasture. She quickly discovered that she could outrun him and played with him a little bit. She finally realized that he was kind of scary and ran to me for safety – naughty girl! Magoo – one of our guard llamas. 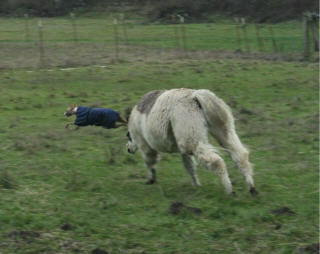 Magoo chasing her out of the pasture.